I have happy news this morning!!!!! I was invited to join the Love To Scrap! Design Team during my Guest Designer stint & I happily said YES!!!!! I'm delighted to be working with some FAB designers & I'm more than honored that Leslie chose me to join her awesome team...thank you & I'm looking forward to working with you all!!!!! Our challenges are posted on the first & third Mondays of every month and our theme this time is Anything Goes! Our sponsor is DRS Designs & they graciously gave each of us an image and sentiment to play with--THANK YOU!!!!! 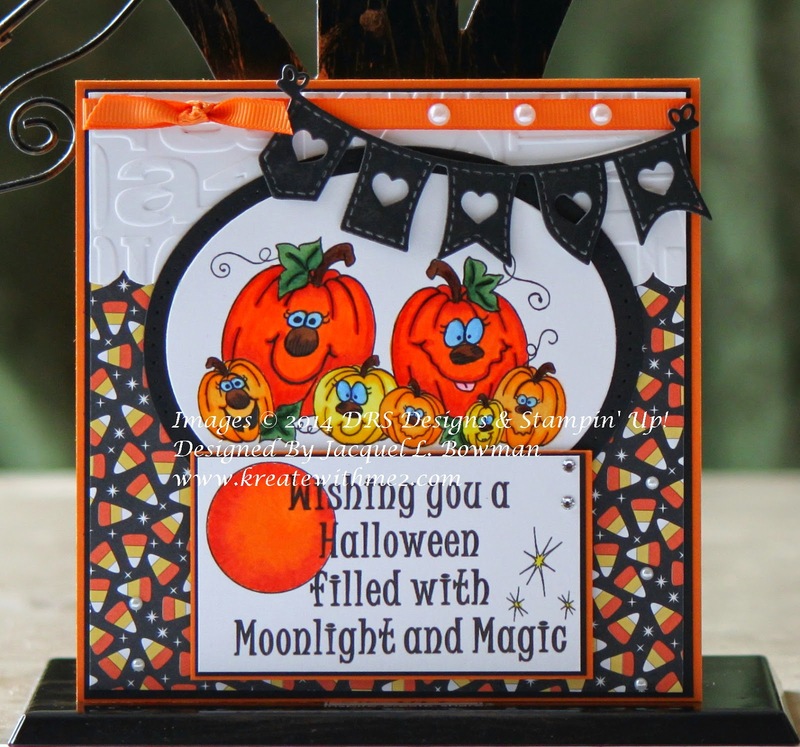 Since Halloween is right around the corner, I chose to use Peculiar Pumpkin Patch & Moonlight & Magic Halloween Greeting on my creation...I just LOVE those pumpkins!!! My teammates made some really cute cards as well so check out our blog to see what they created & while you're there; read up on our rules so you can play along with us! I'm looking forward to your Anything Goes creations....have fun everyone & happy stamping!!!!! Great Impressions ~ Get Your Spook On! It's eye-catching! I love those lovely pumpkins!! Congrats on your new DT position, se well deserved! This is such a sweet Halloween card, with the perfect color combo for this occasion and cute image and DP! Jackie...This is SO cute!!! Makes me get excited for Halloween to get here :-) Beautiful job!! Can you say amaaaaaazing?! Awesome coloring and I love the candy corn paper! Great job with this image, Jackie! This card is too cute. Those pumpkins are so sweet. I love that patterned paper and your heart banner. Thanks for joining us this week at The Shabby Tea Room. Hi Jackie! This sooo cute. I like so many things about it...let's see. Love how you added the dry embossing in the background and that fun banner! And I like how you added the moon to the sentiment! An overall really fun card!! and finally greaaaat paper though i don't know what those cones are. earplugs ? Adorable card...beautiful coloring and the image just makes me happy!!! Congrats on your DT spot, I can see why!! Thank you for joining us at "The Shabby Tea Room" for our "Autumn Bliss" challenge! Congrats on another DT spot!!!! This card is super adorable. Cute image and sentiment. I like the candy corn DP. This is so cute, Jackie! I love those adorable pumpkins and that cute little black banner! Lovely catd! Sentiment is wonderful!Thanks for playing at Suzy Bee's Bloomin' and good luck. Very fun card. THanks for sharing it with us at Robyn's Fetish Challenge. Great card. The image is so cute. Love the sentiment and banner!